Talk to Zimbabweans and you go away with the feeling that the cash crisis that the country is facing is the most pressing problem that people are facing. It is not. 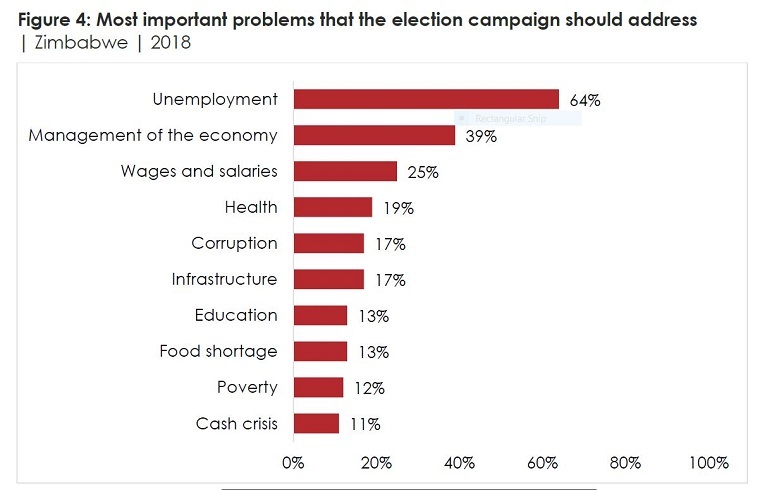 In fact, it ranks at the bottom of the top 10 problems that people would want the present election campaign to address. Top of the list in unemployment. Some 2 400 Zimbabweans were asked to list up to three problems that the country was facing which they wanted the election campaign to address in a survey by Afrobarometer. Unemployment was way at the top with 64 percent. Management of the economy was a distant second with 39 percent followed by wages and salaries with 25 percent. People were more worried about their health than corruption, and were more scared of being poor than having no cash.